I've long argued that there are few things as amusing as seeing Gotham's Penguin go raging to his full fury. Penguin, Our Hero shows that our favorite villain has not lost his power to be fun when he's bonkers. We also get to see our favorite couple showcase themselves to their very best. Our Pengy (Robin Lord Taylor) is now a full-blown megalomaniac tyrant. He wakes up every morning to his own choir dressed in Mao-type rags singing his special anthem Penguin, Our Hero. While his loyal aide Mr. Penn (Andrew Sellon) attempts to let Mr. Cobblepot know of the growing discontent within Penguin's dictatorship, the only thing Pengy cares about is himself and his bulldog Edward. One imagines Pengy is drawing lessons from Hitler, who had a similar passion for dogs that did not extend towards people. To his horror and anger, members of various biker gangs have joined forces to bring Penguin down, blaming him for various hits on their membership. Penguin, for once, is innocent, but he has no qualms about torturing the bikers who dared ruin his breakfast. It isn't long until the discontent in Cobblepot's kingdom spreads to where Mr. Penn, the Gertrude Kapelput Memorial Choir and even Edward flee to Haven, the one safe area of Gotham run by Captain Jim Gordon (Ben McKenzie). Penguin gets the Lo Boyz, Undead and Street Demons to raid Haven and take back what's his. Pengy ends up getting played himself, and now finds he must join forces with Gordon to save himself. 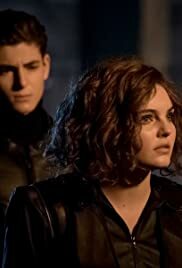 In the subplot, Selina Kyle (Camren Bicondova) and Bruce Wayne (David Mazouz) go to the 'Dark Zone' of Gotham to seek out the elusive Jeremiah Valeska. Bruce wants to capture him and bring him to trial, but Selina just wants to kill him. While Bruce uses stealth, Selina believes in the direct approach. The direct approach is to participate in the Satanic Rites of Valeska, headed by his High Priestess Ecco (Francesca Root-Dodson), who dons garish makeup and uses the term "puddin'". These wicked rites involve supplicants playing Russian roulette with each other. Selina cannot bring herself to shoot someone in the head and manages to survive. The fight between Selina and Ecco is interrupted by Bruce, who is determined to save Selina from her darker impulses. She, however, will not be denied and handcuffs Bruce as she pursues Ecco, and hopefully Jeremiah. Penguin, Our Hero has a lot going on and its to its credit that it balances both plots quite well without feeling one is shortchanged. 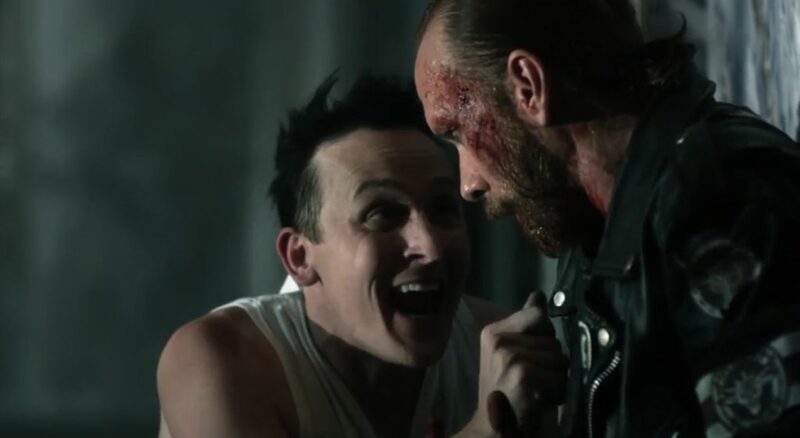 The bulk of the episode is devoted to Pengy's story, and once again Robin Lord Taylor proves himself to be one of if not the best elements of a well-cast show like Gotham. In his total narcissism, in his fury, even in his hints of genuine human feeling, RLT never hit a wrong note. He is comical when he descends the stairs to his own Hail to the Chief in his undergarments. He is frightening in his rage and fury and ease in killing. He is even emotional at certain points. Taylor's shock and fury when learning that his court has fled betrays a touch of genuine hurt, especially after the heavily-accented maid tells him she heard Edward left of his own free will. As he cradles a dying Mr. Penn, he shows almost a sincere heartbreak, more so when he hears Mr. Penn's last words, an apologetic "Everyone hated you". It's as if, like all tyrants, they mistake fear for affection. We also see just how well Mazouz and Bicondova are, more so when they work together. Mazouz's performance of the moral Bruce has a great counterpoint to Bicondova's performance of the less moral Selina. We see that she is not evil but she is also not letting things get in her way, even if what gets in her way is someone she has affection for. I found that after one of their two fight sequences with Dark Zone thugs, Mazouz's black costume could clearly make him Batman with just the cowl missing. He keeps Bruce as someone who uses stillness, stealth and methodical intellect to achieve his goals. His only emotional weak spot is Selina, whom he cares about. Bicondova makes Selina's genuine morality mixed with her rage a fascinating experience to watch. In short, we can completely see Mazouz as Batman and Bicondova as Catwoman. If there were elements in Penguin, Our Hero that might not work well was the unnecessary addition of Bonkers Babs into the mix as she played almost no role and worse was sidelined by the Haven bombing at the end. We also saw yet another person blown up, though to be fair it was not as visible as other times. The fact that Gotham has had more than one person blown up is highly troubling. On the whole though Penguin, Our Hero is a strong episode with a triumvirate of excellent performances by Taylor, Mazouz and Bicondova. As we get closer to the finale of this final season, these three performers in particular are setting a high bar for those following in these roles.